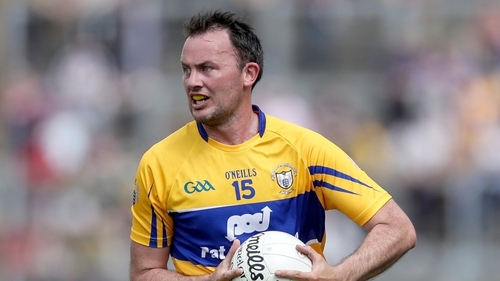 Another masterclass from David Tubridy helped Clare to two precious points in Division Two of the Allianz National Football League. The home side in Cusack Park were playing against the breeze in the opening half, but flew out of the blocks and had the ball in the Cork net twice inside 5 minutes. The first came when David Tubridy picked up where he left off in Newry last week, as he palmed home after Jamie Malone had side-footed across the square to the unmarked Doonbeg man. Cork responded with a pointed mark which was taken and finished by Matthew Taylor, but Clare pounced for a second goal in the next attack when good work from Cian O’Dea and Gary Brennan released wing back Conal O hAinifein into space, and he coolly slotted past Mark White to leave Clare 2-00 to 0-01 ahead. Cork responded well, and got the next two scores from Luke Connolly and a Stephen Sherlock free to cut the gap to three. Turbridy responded with a brace of his own including a fabulous effort from out on the right wing, before Stephen Cronin landed one from distance to leave it Clare 2-02 Cork 0-04 after 22 minutes of action. Clare started to get the better of proceedings on the Cork kick-out, and it was Dale Masterson who profited to land his first point. Dean Ryan then finished off a well taken score after good interchange between Gary Brennan and Keelan Sexton to restore Clare’s six point lead. Cork were struggling for scores from play but did manage two frees thanks to Connolly and Sherlock, but it was Clare who ended the first half scoring through Tubridy and Conor Finucane to see them ahead at the break by 2-06 to 0-06. The second period started at a much slower pace with Liam Donovan pointing in between scores for Clare’s Sean Collins and Jamie Malone. Tubridy and Michael Hurley swapped points before the Doonbeg man landed two in a row to see Clare ahead by 2-10 to 0-8 inside the closing ten minutes. Cork did raid for a goal when Ian Maguire fisted to the net after a long ball into the Clare danger zone, but it mattered little as Clare rattled off further points from Tubridy and Finucane, before the icing on the cake in the dying stages as Kieran Malone slotted the ball home for Clare’s third goal and their first win of this year’s National League campaign. Clare: Pierce DeLoughery; Kevin Harnett, Cillian Brennan, Gordon Kelly; Dean Ryan (0-01) , Aaron Fitzgerald, Conal O hAinifein (1-00); Gary Brennan (c), Darragh Bohannon; Cian O’Dea, Jamie Malone (0-01), Dale Masterson (0-01); Conor Finucane (0-02), Keelan Sexton, David Tubridy (1-07, 4f). Subs: Pearse Lillis for Bohannon (HT), Sean Collins (0-01) for Sexton (HT), Kieran Malone (1-00) for Lillis (53 mins, inj), Alan Sweeney (St Breckan’s) for Masterson (63 mins), Cormac Murray for Finucane (74 mins). Cork: Mark White; Kevin O’Donovan, Kevin Flahive, Conor Dennehy; Stephen Cronin (0-01), Stephen Sherlock(0-02, 2f), James Loughery; Ian Maguire (1-00) (c), Ronan O’Toole; Tomas Clancy, Mark Collins, Mattie Taylor (0-02,1f); Michael Hurley (0-01), Ruairi Deane, Luke Connolly (0-03, 0-02f).